NES Chip 'n Dale: Rescue Rangers 2 (USA) "2 players" in 11:04.65 by dragonxyk. Like the first movie, a two-player run makes for some interesting things, like Chip and Dale carrying each other around, and heavy abuse of death to take advantage of balloons. By killing off one character, he respawns on a floating balloon, thus going ahead of the other character. 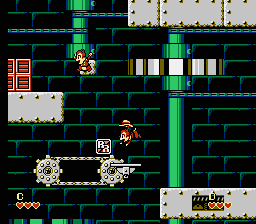 Unlike the first, however, this run frequently destroys bosses by using one of the characters as a weapon. Only in the Chip 'n Dale series can such apparently irrational action be justified. This movie, the second submission for this game by dragonxyk, is a 18.55-second improvement over the previous movie. See here for a run with just Chip.